Two portraits of the Cambridge family were released by the Palace to mark Prince George's first birthday tomorrow. As expected, they offer lovely shots of William and Kate with their son in an informal setting. 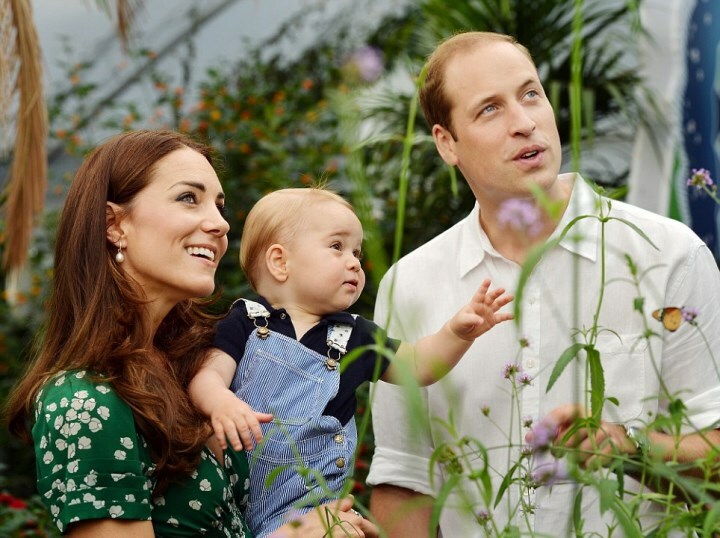 In this beautiful photo below Kate is holding George as he touches a butterfly which is resting on his father's hand. I think this one is my favourite official photo of the family together thus far. A closer look at the Blue Morpho butterfly. The photos were taken by Press Association photographer John Stillwell at the Natural History Museum's 'Sensational Butterflies' exhibition earlier this month. On Saturday night the Palace released a portrait of George toddling towards the camera. Shall we take another look? (I don't know about you, but I never tire of seeing photos of Georgeous). A closer look at the birthday boy. Can you believe it's been a year since this? The portraits have proven very popular with tomorrow's papers. A look at the cover of The Express. For the portraits, the Duchess selected her Budding Heart Silk Tea Dress by Suzannah. 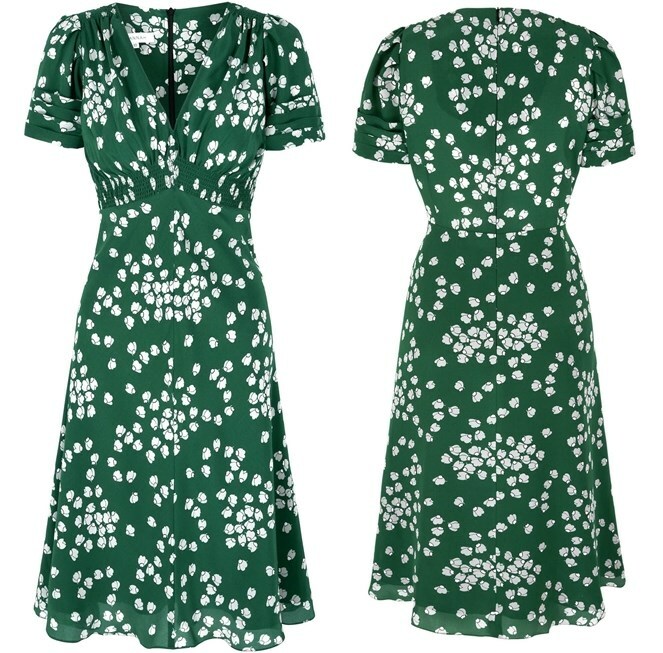 The £475 frock is based on the brand's best-selling 1930's inspired tea dress style. It's described as "a fabulous day dress" with a matt silk crepe skirt part lined in 100% habotai. The Duchess wore the pretty frock underneath her Erdem coat during the royal tour and most recently at the Tour de France send-off. It's great to finally see it properly and it was an excellent choice for the nature and location of the photo-call. Kate accessorised with her Annoushka pearls. It is believed the Cambridges plan to move to their country home in Norfolk shortly where Prince William will take up a full-time position with the East Anglian Air Ambulance. 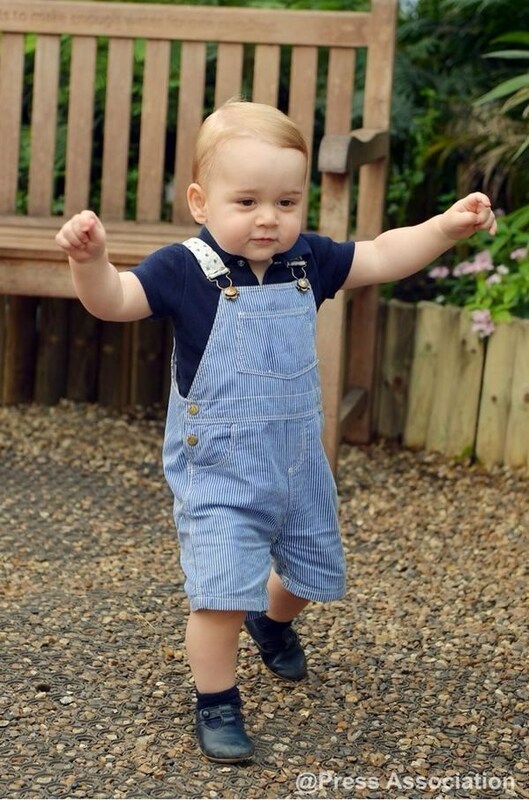 This may be the last time we see little George for quite a while, at least in an official capacity. Royal commentators hold the opinion the public will see far less of the future King compared to previous generations. What do you think of the birthday portraits? 'You just keep reminding yourself that although it's very important, for the couple and the-about-to-be-born baby, it's just another healthy young couple giving birth to another, hopefully, very healthy baby. The Duchess attended Sir Marcus's retirement party earlier this year. With George's special day almost upon us, a wide variety of articles looking at the Prince's first year and his future have been published. One particularly unexpected piece makes a shocking prediction. 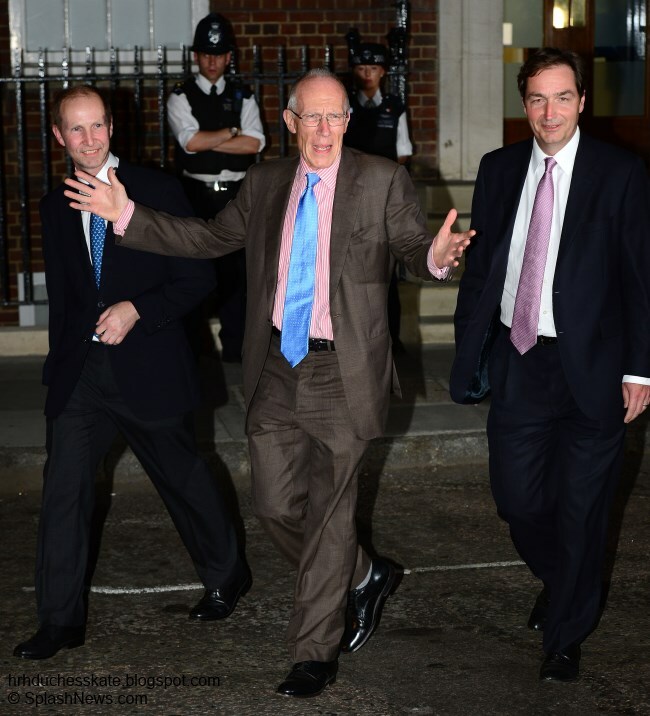 Diana's royal biographer Andrew Morton believes William will abdicate in favour of his son in time to come. 'I think William will become the first King to do the job for several years but then abdicate. This could mean George is still relatively young when he takes over, which obviously mean he has a totally different life ahead of him. It's quite a shocking prediction, one that will hopefully never come to fruition (one I cannot envisage). Perhaps, as William gets older a love for the role and all it encompasses will develop. It would now seem full-time duties are some time away, in fact, and I would predict not until Charles become king. Majesty Magazine's Ingrid Seward dismissed Mr. Morton's claims as "ridiculous". The Palace has confirmed The Duchess of Cambridge will visit Malta on 20 and 21 September to represent The Queen on the occasion of the 50th anniversary of Malta's independence. The two-day trip will mark Kate's first solo overseas visit as a member of the Royal Family. 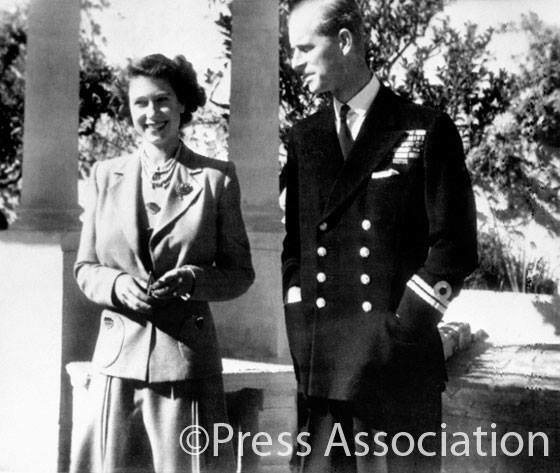 The Queen and The Duke of Edinburgh lived in Malta during the early years of their marriage while Prince Philip was first lieutenant on board HMS Chequers. It is believed they were extremely happy there and no doubt Her Majesty will be very pleased to see Kate representing her in September. We'll hear about the itinerary and more details in due course. 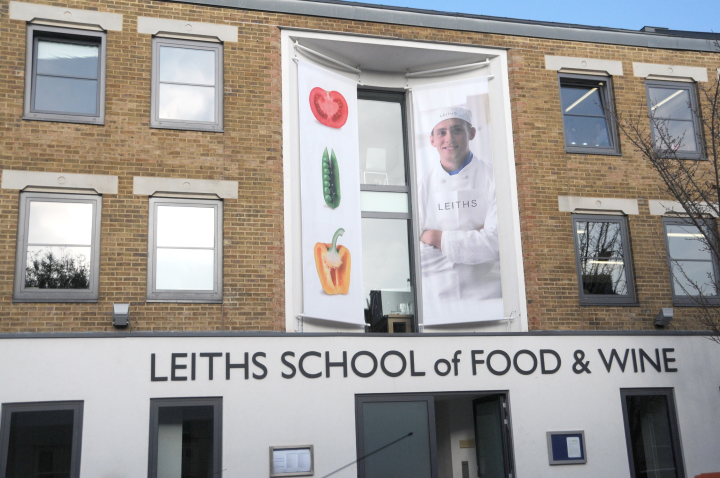 In other news, it was revealed last week that Kate attended a two-week cookery course alongside popular television chef Rachel Khoo at the prestigious Leiths Cookery School - and passed with flying colours. The school has a reputation as a first-class culinary institute for chefs. Students come from all over the world to enjoy dedicated teaching and a friendly atmosphere. Interested amateurs like Kate enjoy perfecting new and much-loved dishes and learning some of the tricks of the trade, enabling them to add a professional touch to their own cooking at home. Courses usually cost around £1,600. 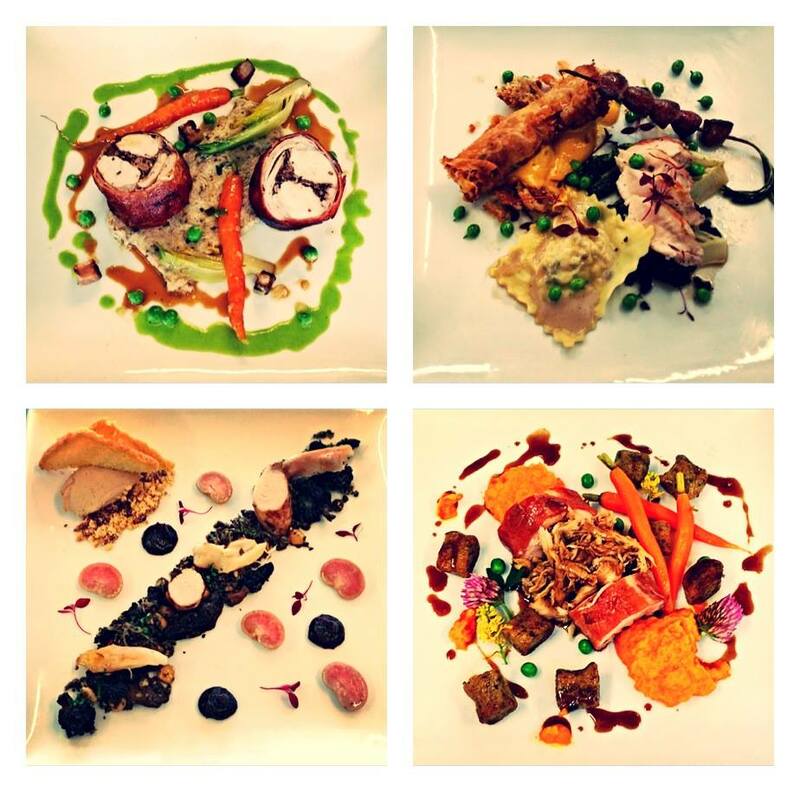 A look at some of the school's popular dishes. It is not known exactly when Kate took the course, but her sister Pippa also undertook one at a different cookery school. It looks as if they're both following in their mother's footsteps with a keen interest in cooking and preparing delicious family meals. The Duchess is said to be a keen cook and was photographed grocery shopping several times during the couple's time in Anglesey. William and Kate are very rarely spotted out for dinner, and it is thought they prefer to host dinner parties for their closest family and friends at Kensington Palace, which boasts two kitchens. Kate had the existing 350 sq ft kitchen, originally designed by Princess Margaret's husband Lord Snowden, refurbished at a reported cost of £170,000. Courtiers stressed that the additional "private, family kitchen" was paid for by the couple's private funds. In tonight's fashion corner, we begin with news on the pink peplum Alexander McQueen ensemble Kate wore in Adelaide during the recent royal tour. It was believed Kate was wearing a top and skirt at the time, however it turns out the garment is in fact a dress from the brand's Pre-Fall Collection. The Wool and Cashmere-Blend Dress is currently available at My Theresa for £1,985. It's partially lined with a zipped back, hook fastening and a flared skirt with high-low hem. A closer look at the dress. It also comes in poppy red, a colour which suits the look and structure of the dress better than the soft pink, in my opinion. Now that we've seen the piece properly, has your opinion changed? If I recall correctly it wasn't one of the most popular pieces worn during the tour. Finally we take a look at the The Mirror's offering George: The First Year. 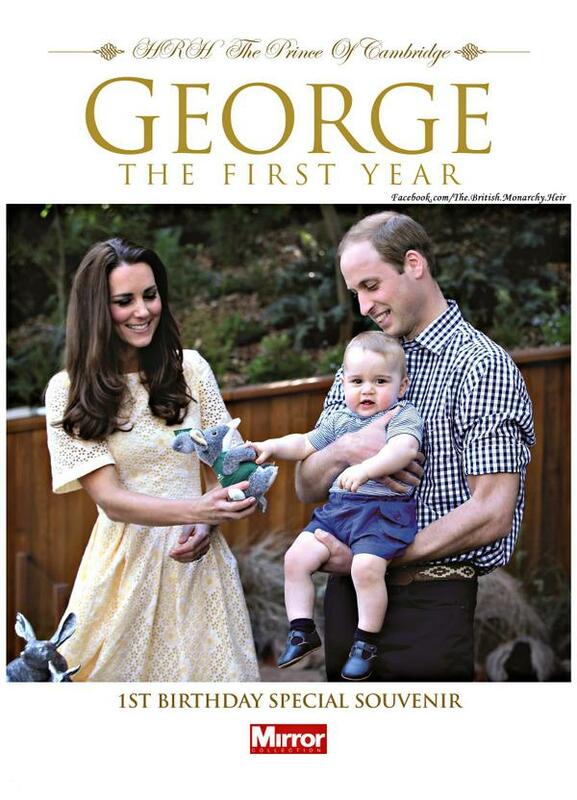 The £4.99 84-page commemorative magazine recaps George's first year from his first appearance at St. Mary's Hospital to his christening and the royal tour. Sending Prince George the happiest of birthday wishes! Is it just me or is this baby HUGE! :) Haha I love it! Wonderful post as usual. Beautiful pictures showing a completely different side to George---thoughtful and interested.. They really are a very handsome family. Oh, I really, really like these photos! It's so wonderful seeing them out and enjoying family time, even if it did double as an official photo shoot. I know we say it all the time, but George is such a big baby for his age. It shouldn't be a surprise, since his parents are tall, but it is each time we get a new photo of him! And I suspect I'd really love Kate's dress, if I could get a better look at it. Here's hoping she'll wear it again in the future, and that we'll be able to get a full-length shot of it without a coat! He is so BIG!!!! Can't believe it's been a year! I really wish we could have seen more of Kate's green tea dress; it looks so beautiful and she's never given us a decent look at her in it. However, you can just tell how happy this beautiful family really is! Great job Charlotte!!! On another note, I really hope that William never abdicates one day; I think it would honestly be disrespectful to the position and quite selfish. I think as Queen Elizabeth and Prince Philip get older William and Kate need to take on more royal responsibilities and not just behind the scenes. I don't want them to move to Anmer Hall and become recluses!!! While the portraits show a beautiful family and an adorable little boy, I'm actually not too found of them. I feel like there are too many distracting elements and very few of them are actually butterflies (which would have been cool). Maybe it's because I've been waiting to see these photos since we first learn about them, but they kind of failed my expectations. George is absolutely adorable, though!!! Even the thought of not seeing him for awhile makes me sad, hope William and Kate don't become reclusive once they move into Anmer Hall. "Reclusive" is what they hope for. Unfortunately, their life path does not allow that. Privacy is one thing. Reclusive is another. Anon: 23:07. To answer your question and I speak only for myself as a royal watcher, I use to collect books, and magazines of famous royals, but after the death of Princess Diana, I cut back because it became overwhelming. However, with the advent of social media, pinterest and the like, I find that I am able to collect more paraphernalia and best of all storage is not a problem anymore. I still like to collect postcards and of course I read all the books I can lay my hands on, but this time around I am more "chosey" about authors. Also, I can download books to my ereader, which is a "god send." I do have several books about the Duchess's life, romance and style. I also have a commemorative plate from George's birth. And I've saved all the souvenir magazines that feature the royal family. However, storage gets to be an issue so I frequently go through them and save only the best. One thing I've noticed though is all the magazines have the same pictures in them, you'd think they'd take shots from different angles or something, but no they are that same. Wonder why? I have some royal knick knacks, including wedding cups from Diana & Charles' wedding, William and Kate's, and the Queen and Prince Philip. Or is that a coronation cup. I can't remember. I've got one from George VI and the Queen Mother's reign, although I can't remember what for! And when I was in London last year I had to get a royal baby cup. Compared to some people, though, I've got nothing! When I was in London I was extremely surprised to find books and all sorts of souvenirs of the royal wedding and Kate at their souvenir shops. Since they have always complained about "the treatment given to Princess Diana from the media/paparazzi" I never expected to find photobooks, cups, etc. there with actual pictures of Kate. I guess I expected only cups with royal coat of arms and pictures of the castles. Anyway, I bought magnets and keychains, etc. showing only places/things (as I did in the rest of our stops in Europe and as I do wherever we visit). I love it!! The photos are absolutely beautiful--they are a great-looking family! I hated that pink dress from the tour, I thought it made her look matronly! It does look better in red, but I think what changes the look of it on the model is that the model actually has more meat on her bones. She fills out the dress in a way that Kate doesn't and I think that's really what makes it ugly on Kate in my opinion (not to mention the awful color). P.S. George is sooooo cute!!! The thing that stands out to me is the hemline was supposed to dip in the back. Not my favorite look. Harry as a baby. His hair is not that much redder than George's is it? His eyes look dark too. Sorry; the post above by me ^^ was supposed to go under Anon England's comment. Oops! Harry was such a pretty baby. I guess I see a difference in skintone--Harry seems/seemed (to me at least) to have fairer skin, the type you typically associate with redheads. George seems to be a bit darker and/or more olive-toned to me, so it's harder to imagine him growing up to be a true redhead. I agree with everybody else that he'll probably have lots of reddish tones in his hair, though. I suppose time will tell, though. My husband was white-blonde until about age 4, and now he has very, very dark brown hair. I wonder if George will be a redhead, as mentioned in previous post? His hair definitely looks 'auburny'. I've wondered the same thing. I doubt his hair will be as red as some of the Spencers' or Harry's, though. George's coloring seems a bit darker like his mother's, so I suspect he'll be more of a light brunette, but with some reddish tones. That seems like a good guess, Laura. They are just gorgeous! It looks like Kate has a spot of dribble on her shoulder in the second photo! I thought so too about the dribble on Kate's shoulder. So sweet! Nice catch! Didn't notice that. I love it! Georgeous George! Love you, little man; you are beautiful and Happy, Happy 1st Birthday. I love the photos: they captured a very animated baby George, the personality that we have seen throughout the tour of New Zealand and Australia. I think the photographer did a great job and seemed to have captured very well, the vision of the Duke and the Duchess first birthday photo of their little one and all three as a family. Well done. Well, that's utterly delightful and a fresh departure from earlier portraiture of royal babies. In the last post (I don't think my comment is up yet) I suggested that W&C don't seem inclined to copy the styles royal photo shoots from other eras. That was evident from their engagement cuddle onward. This confirms it. Lovely post!! Beautiful family!! Happy Birthday George! Thanks for getting these on so quickly. They will definitely stand out as unique among the Royal Family first birthday pictures. George is adorable and much loved. Thank you Charlotte!! Awww... I love seeing them as a family. Although I must admit that the first picture is my favorite (of him). Lovely pictures of George! Oh my I'm sure they held him back from clasping the butterflies. My son grabbed a hamster from his cousin when he was 4 and the hamster had a short life. Awww boys so full of energy. George is no doubt keeping everyone on their toes. I think the prediction about William abdicating is very far fetched. Goodness, I think he is glad get out working and helping his community with the Air Rescue and letting Prince Charles take the role of King that is rightfully his. As for cooking :) :) :) enjoy Kate. Our family loves to cook for each other too. i remember an interview, once, where Diana said he wouldn't want it (the crown). inf act, what she was saying was that harry would make the better king because of that. obviously, harry isn't next in line after william anymore, but all the same. his mother said it, herself. and when he was so young. she already knew. and i think he rather enjoys "normal" life with the middletons. i think it's unlikely would abdicate, but not that far-fetched. I think Diana was talking about Charles, not William. She made it clear that she wanted her sons to have their royal destiny. Correct, Anon 16:06. Diana was referring to Charles. This is the transcript of her Panorama interview. The subject comes up about 15 comments from the end of it. Has anyone sent George a card/birthday wishes and have you received a response? I sent a card soon after he was born, and was pleased to receive a postcard with a photo of the three outside the hospital; I had read about it on this blog! Kate- I think the Queen set the bar high when it comes to keeping up with correspondence. I understand she is absolutely religious about answering mail, or seeing that it is done. She has done so since early times and has been quite disciplined about it. While I was not a fan of the first portrait that was released, I find these two nothing short of spectacular. I like the one where they are all looking up at the butterfly the most...just such a wonderful moment, and they make such a beautiful family. I am thrilled that this dress is officially photographed becauseI absolutely adore it, and it just might be my favorite afternoon dress that the Duchess has worn. Wonderful, wonderful post Miss Charlotte! I agree it is a fabulous dress and Kate looks stunning! What happens to the KP apartment if they move to Anmer Hall? Will they use it as a London base? I can imagine that will draw some criticism, considering that it just got renovated and now they are moving already. They could have stayed at Nottingham Cottage and do all the renovations at a later stage if they were going to move anyway. But that is just my opinion, not meant to insult anyone. Happy birthday George! Wasn't very fond of the portrait released Saturday but love these ones. M, they're not moving, not the way most people think about it. KP will be their London base for many years to come, but they will spend a good deal of time at Anmer Hall in the near future. Right, royalfan--both places needed renovations right away-and would have been far more expensive later on! I understand what you mean, royalfan and Jo. It just seems weird to me if you think about it. The renovations at Anmer Hall were at the same time (or just a short while later) than those at KP. And 2 expensive renovations in such a short period of time.. I don't know. Maybe the KP renovation could have started around now or could have been done much slower. Considering the fact that they are not fulltime royals, the whole KP apartment isn't necessary yet in my opinion because they don't have London engagements 3-4 times a week. I understand some renovations were urgent, like the asbestos removal. But I just think that doing the renovations with a bit more time between it would have been a better signal. Kate and William's career moves and choices (William's gap year for example) are drawing criticism already so they have to be careful, if you ask me. The public is more and more like 'I want to see what I'm paying for'. Kate and William really appreciate their privacy, and that's fine. But I can imagine it will come across to some as 'I am paying for you, why aren't you more open about your life', to put it in this way. Some people can't make a distinction between the royals' own money and public money so their judgement will be wrong, but still. I am still a fan of Kate and of course of this wonderful blog, and I really don't want to insult anyone. I just tried to carefully write my opinion down. Yes, I agree with you, well-put. Love the pictures! They both seem determined to do things "their way" and good on them! The photos are relaxed and interesting as a result. As for Andrew Morton - piffle! After what happened with Diana and Andrew Mortins book and how that must affected William I wouldn't expect him to have even the teensiest insight into Williams thoughts for the future! Very good news to hear that Kate is off to Malta on her own - how exciting! Anyway, happy birthday Prince of Cheeks - you're growing up fast! Happy Tuesday everyone. AM's statement is a cry for publicity. How would he know? The man is speculating and making headlines by doing so. SUCH a lovely family! Sigh. Thank you Charlotte!!!! You are all so kind! I'm just so pleased you all enjoy reading the blog and I thoroughly enjoy reading your comments and thoughts! It is actually more than a community to me. It feels like family to me sometimes- with all that entails.So glad you are up and around again, Simone! "Sisters! Sisters!" Was that sung by the Andrews sisters??? Sisters across the world :-) or Aunty Marg?? I'm doing really well thanks Marg. Back up and about after the accident and focussing on getting fitter and stronger and the lovely side effect of not working for a few months is I can play happy housewives - which after only getting married at the end of December is fabulous fun! Charlotte--your/our blog would make s great story--movie--or even a TV series!! So much drama & personalities & their/our stories! I so echo your well written thoughts Simone. It took me a while to be aware of the comment section, then longer to figure out more posts come after I read them and can be anywhere on the comment page. It is the best blog I have ever seen. The spirit of a community as Marg put it where I can freely post my respectful opinions and results in getting to know others everywhere in the world. I also have never posted until this blog. I do so thank you all for your awesome posts and to Charlotte for inspiring us. Simone- The Sister song was in "White Christmas" with Bing Crosby and Danny Kaye (?) .Rosemary Clooney ( George's aunt, Esti ! ) and another blond lady sang it. Ask you Dad about them.I have a mental picture of them in their floaty blue outfits with ostrich fans. ..."never were there such devoted sisters" ..ends with ,"lord help the sister who comes between me and my man." I know. I'll go quietly- OT , again. Just have to chime in. I'm a relatively new commenter and I love the atmosphere here. It really is like a community and I am in awe of the level of maturity in most discussions. Thank you so much Charlotte for providing this little safe slice of the internet! You are extremely talented and I admire your commitment and level of detail. Keep up the good work! My inner White Christmas nerd is coming out in full force....actuallysince Vera Ellen was not a singer, Rosemary Clooney sang both parts and Vera Ellen lip synched. Sisters is mine and my cousin's "song." Simone, Rosemary did have sort of a "breathless" quality to her voice. ha! Rebecca, you might be in awe of the maturity around here, but the rest of us are in awe of your command of English, along with the rest of the non native English speakers who post here. Andrew Morton babbling on again? He had his ten minutes of fame with Diana and he keeps trying to look like he knows what William might do. Considering that I imagine William loathes the man, doubt he has a clue. I admire and appreciate the more informal approach of the Cambridges. They certainly seem to be handling their decisions on their own terms as much as possible. As for the notion of William abdicating, I don't think it is quite as far fetched as it first seems. Many European royal families "do" succession differently than the BRF, so there is a precedent, even if not in Britain. Who knows what the future will hold? However, I'm not sure William would want to burden his son prematurely, either. Interesting to think about, though! I was one of the few (apparently) who liked the Alexander McQueen peplum dress on Kate during the tour. She has a clear preference for high-neck frocks and wears that style well. It's nice to see her mix it up on occasion. Seeing the dress in the poppy color makes me like it even more. he looks adorable and oh my gosh her dress is lovely so glad we see it. I love all three of them together they look so in love and happy! Throughout George's life, I've had such a hard time figuring out which parent he looks like. In the two new pictures, I think George looks like Kate. In the first picture released, I thought he looked just like Will. I guess my final conclusion is that he is a perfect combination of both! Beautiful photos of a beautiful family. Just gorgeous! My youngest is 3 mths older than George, he is also by far the busiest of my 3, crawling at 5 mths walking at 10 mths. Maybe babies of 2013 are speedy ones! I love watching this family as even though they live a different life to the rest of us, the family values/love is just so relatable, and isn't this is what the royals are about-to provide us with role models? Also kate was sick?? Her hair has tones of a more natural hair colouring? Hmmm?? Thanks Charlotte for this wonderful post. I absolutely love all the photos of Prince George and family. The one of him walking and reaching out to touch the butterfly is priceless. Oh my but he is growing up so fast. Happy first birthday Prince George. May you be blessed with many more and I wish you health and strength. OH, What great photos !! I love all three. They all show different sides of this little guy. The first shows him with all the energy that we have consistently seen from him since the tour in April. The last two show a more gentle and introspective side. 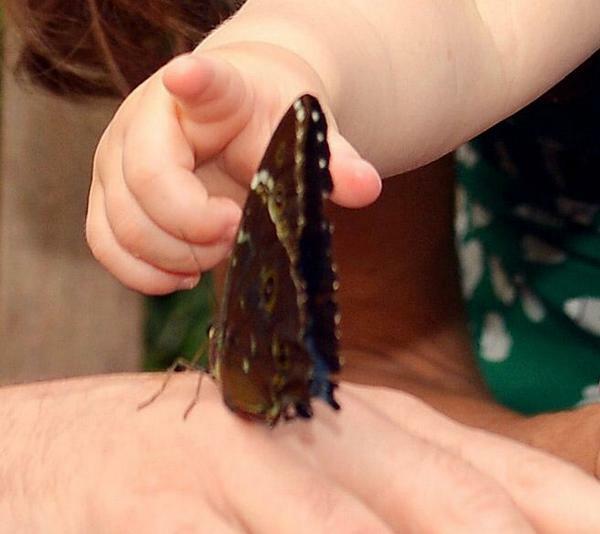 I can almost hear Kate or William saying to him "gentle, gentle" when extending his little hand to touch the butterfly. I sort of did like the Alexander Mc Queen, but think I like the darker coral one a little better. It defines the fact the hem line was designed to be lower in the back than the front rather than just looking "uneven". Love that she was able to go to the cooking school and now has a family kitchen to prepare those scrumptious looking meals. Do we know when those photos were taken of Kate at the school? As for Andrew Morton - I think he is just trying to keep his name in the "Media" and "stir the pot". I think he has been well grounded by his Gran as to his responsibility to maintaining the monarchy. Hummm..wonder if Andrew Morton has joined the republican movement. Can't wait to see Kate in Malta. Your comments are a great addition to this blog, Eva B.! I am reading from the bottom up tonight. I was surprised how similar some of our thoughts are, especially regarding George and his interaction with his parents. Also, the question about the cooking pictures. They are from the Canada tour. As I mentioned in my comment below,( if it doesn't get deleted for some reason) you can see "Quebec" written on the pocket. Thanks marg for your encouragement. I did wonder about the "Quebec" monogram. Thanks for the info. The cooking school photos were taken on the Canada tour. You'll notice the "Quebec" school name stitched on the jacket. Love the pictures! I'm curious if the solo trip in September might put to rest the pregnancy rumors. I can't imagine a pregnant Duchess going solo on a trip out of country, IMHO. What an adorable family! I love all 3 pictures! Is there any dates in Kate's schedule besides her tour? I wish I can take a cooking class. I like to update my skills. But isn't it strange that Kate didn't wear her her up for the class? I hate when I find my hair in my food, especially when I have it in a ponytail. July 28/29 - The Duke and Duchess of Cambridge and Prince Harry will attend the Commonwealth Games in Glasgow. August 4 - The Duke and Duchess will be in Mons, Belgium, representing The Queen at a ceremony commemorating the centenary of World War I.
September 28/29 - The Duchess of Cambridge will visit Malta. Details TBA. Hi Emily- As Charlotte didn't address your question about the hair, cooking class etc., I 'll give it a try.Those pictures were taken on the Canada tour and had nothing to do with any cooking class she may have taken in England. You can see "Quebec" written on the pocket. Also, the class Kate reportedly took was a basics class , which no chef from tv would be taking. Obviously, the class was quite some time ago. The woman apparently was trying to get publicity for her show by bringing the subject up now. There has never been any date given for the time she took the class, but the "Kate was ill " fit right into the recent pregnancy stories touted by the tabloids. Hope this explains a few things. Thought Kate was going to Malta on the 21 & 22 of September. This photo was not of a cooking "class" but a hands-on style drop-in at a cooking school while on the Canada tour. She made up a few appetizers and were whisked off somewhere else. Catherine wouldn't have put back her hair for that reason. Absolutely beautiful! The Cambridge family is lovely! 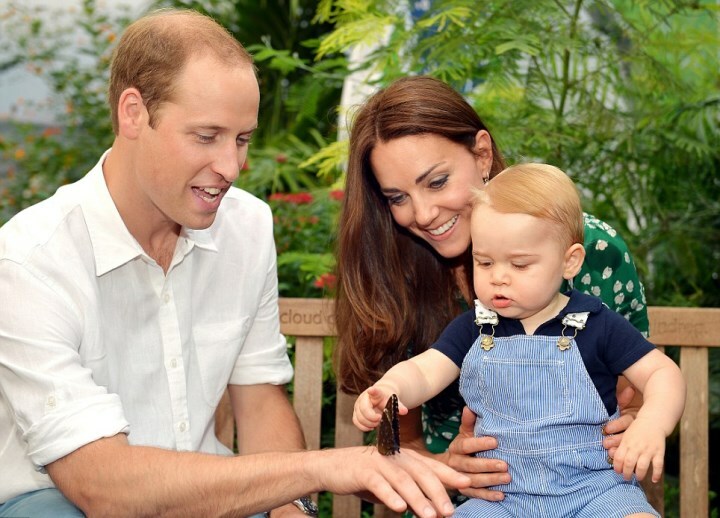 I will say my favorite of the two is the one with little George reaching for the butterfly. So very sweet. Kate's smile is just beautiful. Such a treat for all of us! William and Kate are very blessed with a happy, healthy baby boy! Very much looking forward to Kate's trip to Malta. Sounds like they will be tucked away in Anmer Hall in the upcoming future. I'm a bit disappointed not to see them dive in to full time duties, but they are obviously seeking privacy and normalcy (as normal as they can be in their position). I guess now is the only time it will be afforded to them until Charles ascends the throne. Doesn't change my liking or opinion of them at all (still a thumbs up and huge fan), but just that we won't be seeing much of them. Sigh. The cooking class sounds wonderful and I'm sure Kate had a great time. Sarah from California, thought of you and your love for cooking. :) I would love to see Kate in action in her new kitchen at KP. Why, oh why did Rachel Khoo say Kate was ill for a couple days. Everyone will jump on the pregnancy bandwagon. Oh dear. I think in the past few weeks Kate has been pg with twins and triplets according to some magazines. Will it ever end? Back to dear George.... Happy Birthday HRH Prince George! I hope your day is full of life, laughter, and fun! Congrats to Will and Kate on a fabulous first year of parenthood! Charlotte, THANK YOU for the great post! It made my evening! The pictures are nice and natural but something about them underwhelm me. They don't look "professional" in some way to me. Something about the lighting maybe. I would've loved to see one of p. George looking straight into the camera and one of him smiling. Im not sure we've ever seen him with a real, full smile before. He does look big on Kate's lap! Quite a difference from the birth photo where she's holding him in her arms. I agree William looks great in that one pic where he's looking away and his eyes appear very blue. I'm actually surprised George's eyes came out so dark since his parents' are both light. I can see the possibility of William abdicating. But I think he would be very old (late 70s, 80s?) and of course he would only do it if George wanted to take on the role at that time. We shall see! I'm surprised by George's dark eyes, too. I think they are probably hazel rather than really brown, but I can't decide for sure. What do you think? They are such a beautiful family. On another note, I think as people live longer and longer, abdication is a very viable option that has nothing to do with William wanting or not wanting to be king. It would have looked pretty bad all these years if William was walking around chomping at the bit wanting to be King when his father had a lifetime of waiting ahead of him and many people preferred William over Charles. It's also pretty grim to be in a position in which you can fulfill your destiny only if your only living parent dies. It's quite a burden. I don't find it unusual that he doesn't particularly focus on that aspect of his life. We are seeing abdication all over Europe. It makes sense that the heirs should ascend to the throne when they are robust instead of in their declining years. Remember, a life span of 50 was old, not too long ago, now it's merely middle age. Retiring is not a bad thing... and that's really all abdicating is. However, don't think that Morton guy has any particular knowledge about much of anything. I agree with you. I think the Queen thinks abdication is a dirty word, but I personally don't see how stepping aside is that bad a thing. bluhare, it's bad because of what the Queen Mother turned the chapter into. We've all read that she was mad at her brother-in-law for what he did to her husband and how it affected him health-wise, but her grudge against the Duke and Duchess of Windsor didn't do him any favors. Plus, I suspect that her anger was a tad more personal than that. She resented Wallace for what she got, not just for what she did. That was a long time ago and affected the Queen. I don't see why it should affect the future and I also don't see how one person's grudge should have to impact William. I don't think he should be forced into something he doesn't want -- IF he doesn't want it. Royalfan--Verrry interesting observation about the Queen Mother. bluhare, I don't disagree with you. I was just explaining my theory on why it's such a taboo subject (and will remain so during the Queen's lifetime). Who knows what will happen in years to come. As Jane said, there is something to be said for an heir to ascend to the throne at a younger age. Thanks Charlotte for a great post. I am so looking forward to every new George picture. He is such an amazing little guy. Looks like we can't get enough of him. Have to come to terms with the fact that I will never be able to touch him. I don't have kids and I am not overly into babies and toddler - just no mother genes, really. But I can't resist this amount of cuteness. And Prince George is cuteness overload. Each and every picture is absolutely adorable. His facial expressions!!! I can see a lot of Kate and a lot of William in him. And I am seriously worried the butterfly on Williams hand didn't survive the curious George examination. But Anna, he was using just his thumb and forefinger. Most babies would grab at it with a fist. I wonder if his Mum and Dad showed him what to do. This is an extraordinarily sensitive and intelligent child- with confidence, according to the photographer.You can't beat that combination! I hope he will be allowed to reach his potential. Would love to see him grow up. I think if you tell him that it´s a living being and you could hurt it if you squeeze , the child understands.., My parents have plants at home and when my niece was younger she used said to me: Esti, don´t touch the flowers if not they´ll cry...ha.. I would guess that William moved his hand quickly away just after the camera snapped that picture! 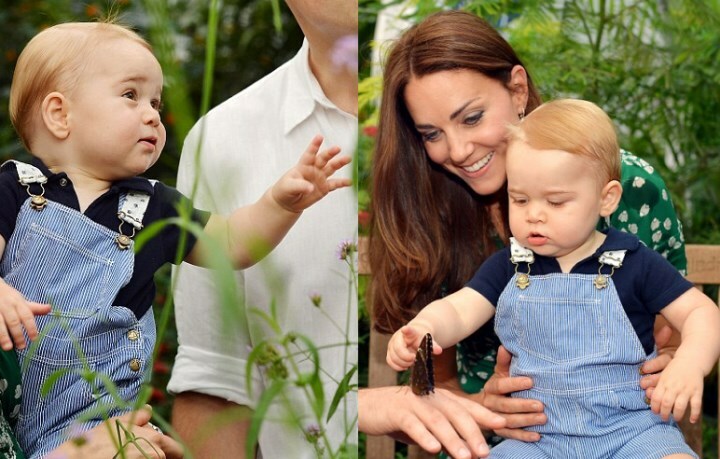 Prince George is obviously very focused on the butterflies in both photos. Beautiful pictures, so natural and spontaneous and happy! I love the way Prince George's hair is escaping from that odd plastered down hairdo someone gave him. The red McQueen dress looks as though the crisp high-low hem is intentional. Even on the model, the pink hem looks randomly uneven. The green dress, what we can see of it, is lovely on Kate. I like the color and the print, so appropriate to the setting. OK ladies, you managed to convince me and it was probably not that bad :) I just couldn't get that Sydney Zoo Bilby ear scenario out of my head: "If he get's it, he will never let go". Haha, I love it when Children are that curious and focused. Esti, what a lovely story about your little niece. She must be a very gentle and caring girl. NOTHING convinced her to stop until my mother bit her to show her how it felt. Never did it again. These photos were taken by a press photographer---the same one who took those outside the Chapel Royal at the Christening. He had a camera-- not lots of lighting. Had the Duke and Duchess wanted the sort of pictures you obviously demand, they would have chosen a different photographer. At least they are different from those of other baby heirs to European thrones were they were each and everyone stuck behind a cake. AMEN Jean. People here want the cream of the crop photographers. But they can't be happy with what they got. These are the photo W&K wanted to share and we are darn lucky we got them. "Anonymous" 00:22, I disagree. William and Kate are in a very privileged position (not all peaches and cream, but privileged nonetheless) and as such they cannot afford to have the attitude that you shared (regarding us being "darn lucky we got them"). George is a future King and sharing him on these occasions is part of the package. royalfan- we could have been given posed, formal ,studio-type photos, which would have satisfied the "package" requirements. Victoria and family, anyone? Instead, we got to peek into their life in an atmosphere likely to intrigue George and bring out his personality. He might not have been drawn out in a palace background. Someone else expressed a similar thought and mentioned the zoo and play-date settings. plus side- lots of publicity for Catherine.s patronage. Love the photos, great post Charlotte! Has anyone found a more affordable dress similar to the tea dress? LOVE this dress but it is out of my price range. Katie, I wish. On "What Kate Wore" there's a picture of the dress in navy and white and I absolutely love it. Green isn't my favorite color, but seeing it in navy makes me wish I could afford it! royalfan- thank-you for the WKW info. The navy version is nice, but I am partial to green. There are different patterns, as well as colors, apparently. The style is so versatile- good for a number of different occasions and figures. I think it brings out the green in the Duchess's eyes. I picked up this CAbi dress on eBay. It's not the same, but it's really pretty and in a similar style. Yes, marg, green does work on her. A friend of mine has similar coloring and greens and browns look great on her. I am particularly fond of the Boutique by Jaeger Alice Tea Dress in Floral Stripe and the Sessun Silk Tea Dress in Clematis Print. But unfortunately, bad times for things green. I am suffering with you because I am crazy about emerald green silk dresses. Georgeous - love that play on words Miss Charlotte! Similar to other posters, I've wondered where George fits on pediatric height/weight charts. He has to be above average height for a 1 year old, yes? Besides massive adorable-ness, in photos and short videos he appears to me to be confident and very determined. His parents' comments about him also point to those qualities. If he does have those tendencies, they are the beginnings of a strong leader. Thanks for the update on the pink McQueen dress Charlotte. Now I understand it much better. The snaps of Kate from a variety of angles while wearing it on tour made it hard to discern if the back hem was supposed to be longer than the front. I love Kate in that green dress. She looks great in saturated primary colors. Years ago, I wore a very similar print to my university graduation ceremony.My dress had a dark blue background and the silhouette was a sheath with a belt covered in the same silk fabric. Even at university as a 22 year old, I knew that fashion recycles but I never saved any of my favorite classic garments. Oh how I wish I had saved that dress plus others. It would have been so easy to park a cedar chest in my parents basement and stash my just dry-cleaned favorite pieces in it but at that age, the 10/15/20 year wait to wear something again or give to a daughter/niece felt like it was soooo far in the future. Younger posters, find a way to save your expensive and/or favorite garments and accessories. You will be so glad you did. So true, Sarah and good advice. I had a few dresses and other articles of well-loved clothing that I now wish - many years later - I had tucked away for the future. Sarah- I love the pink McQueen and especially the green Suzannah Good advice about hanging on to special items . But you are preaching to the choir with me. ha! (my closet museum) Favorite items aren't always the most expensive, are they? marg - Favorite = most expensive? Not necessarily. My 2nd to last sentence may have been confusing. My suggestion was to "find a way to save your expensive **and/or** favorite garments and accessories." Off the top, it might be true for me that my favorites were also the more expensive. If that is true, it would be due to fabric quality. It used to be true that fabric quality increased in proportion to garment price. I love textiles. In fact, that love is more like idolatry.I have been teased that if I was an ancient Israelite, worshiping small statues or foreign gods would not be a temptation for me. I would have been engrossed with lusting after Pharoah's fine linen garments! What beautiful photos of the Cambridge family. Prince George is just so beautiful. And William & Catherine look so happy being with their little boy. But reading these comments have me a little confused. First one why you someone make a comment regarding William's nose. Or comments regarding these beautiful photos of the family. I have not figured out why people have to be so knick picking on such things. I would say we are lucky that William & Catherine decided to share the photos of their little boy. They did not have to do something like this. Just wonder what you all are going to do when William and Catherine move to the country and we do not see them out & about. They are doing what William thinks is best for his family. They want to rasie their children out of the eyes of the press and I do not blame them one bit. All this talk her about William stepping aside to let his son become king when it his his turn is just a bunch of nonsense. William knows what is duty is and he will fill it when it is his time. But right now his most important duty is to his family. ME- you got to the heart of the matter. I agree too. Family first. Delightful. George is so photogenic and the pictures are cute. I was one of the few who liked Kate's pink dress. If she ever lets me look in her closet- then I will not worry about the rest of you if I get a pink party gift. I agree with the majority of you that the Morton story is unlikely but that the chances of William retiring like Juan-Carlos is more likely. Times have changed. I think a lot of the Queen's strong sense of duty was due to her Mother's influence and her Father's example. She won't abdicate due to her experience living through the war and it's effect on her country as well as her family history. The Royal family was arguably much more important and less of a token or symbol back then. Hope no one takes offense at my wording- I mean no disrespect and it's tricky to get what I mean across without stating it bluntly. She pledged her life to her country partly to reassure her countrymen of England's future being secure. William understands what he is committed to but is not as symbolic. He does have different choices than she in case he does want to retire. Interesting thought. If we continue to see more Royals doing that as time goes on- then it be more acceptable for him to do so as time goes on. Look at how much has changed in the last 20 years. He probably has longer than that to wait. I agree, times will change in ways we can't imagine and William might decide to retire in his son's favor. As for the pink McQueen, I thought it one one of the poll categories. I did not care for it on Kate although I would like the poppy color better on her. Not a favorite of mine. Jennifer- it happened again. Misplaced comment. At 17:36-well before the 18:33 comment- i wrote a reponse to your post. It is way down there somewhere. Hope you see it! Jennifer--The Queen was far more influenced to be so conscientious by her father & her Grandmother, Queen Mary. Wow, loved this post. Nice coverage over things but Im not too fussed on the photos for PG's birthday. Think that they are a little ho hum for me. Shame we didn't get to see a little more of Kate's dress. I think it should give her a bit more shape than some of the others she is currently wearing. Im not too sure that Will's will step down for George. He knows how important privacy and how much he is wanting to do something other than be King, so I think that he will keep the position in order for his son to have a life like he is having - being able to do things that he loves, like flying. Personally I think the pictures are gorgeous and reflect their modern approach to family life... lets just be pleased they are happy and healthy together and the future of our monarchy is assured. Abdication seems to be a common theme amongst European dynasties currently, but one I hope is not adopted by the Mountbatten-Windsors. I am a long-time supporter of the Queen and her family but if they adopt a policy of abdication in the future I believe it will be the start of the slippery slope to republicanism. William should enjoy his time now in his chosen career, but accept his destiny in my opinion. I do believe we should be seeing more of William and Kate now, supporting his father who is currently supporting this mother by taking on more of her duties as she gets older. Either that, or the work that they do privately should be more publicised even if its via the diary area of their website. Great blog; I look forward to taking a look at it each day - but think you must be sometimes frustrated by the lack of "Kate-action" to blog about! Happy Birthday, Prince George!!! What a lovely toddler he is (but honestly, aren´t they all?).... Lovely pictures of a seemingly very happy family!! Thank you so, so much, Charlotte, for sharing them with us. It´s such a great pleasure to read your blog - and all the comments from all over the world!! Capturing the attention of a little boy not quite the age of one year with the use of butterflies was clearly a unique choice for a nature setting. All 3 of these photographs of not so little George are delightful. It truly is hard to have one favorite out of the 3. No doubt Kate and William had a very hard time choosing which 3 to share to the world out of the many that probably were taken on that day that we were so fortunate to have knowledge ahead of so many. They were perfect choices of the parents and their son. So many descriptive adjectives that so many of you have shared are quite fitting for the little Prince. George seems like such a content little boy in every photo opportunity. He has to be in a happy household with parents who obviously have a great love for their Gregarious Georgeous. I am saddened at the prospect that we may not see that much of George when they move to the next journey of their lives. I do understand from Kate and William's perspectives that they desire a much more private 'normal' life for as long as is possible. Happy Birthday Prince George. to do? Let them enjoy this time in their lives. uneven hem. Makes the dress standout. Ok, battery is dying and wifi is low so don't have time to respond and read everything.... just gonna say my thoughts. I ADORE these pictures. They are everything I was hoping for this photoshoot. So amazing to see all the wheels spinning inside his little head. And dear lord, he's a big boy. Isn't he?! Happy birthday Prince George! As for what the "Sun"'s preddiction on this day of celebration it is nothing but rubbish. Princess Diana used to call Prince William "my little king" and everyone should remember those words of Prince William when he was trying to confort his mom, locked into her bathroom and who has just been stripped of title of Her Royal Highness. "When I am King" said Prince William, "I swear I will give you this tittle back mum!" We know him to be a man of his word. There is also the ring that Wills gave to Kate on their engagement day. While Prince Charles did not even care to offer a ring to his fiancée and she was left alone in a jewelry choosing the biggest one, what were her feelings? When William offered it to Kate he paid tribute to his mother yes but also put such feelings of his love for Kate in that jewel uniting the two women he most loved together. Some supertitious people saw that as something "insane" or "sinister". Well I see it as very meanful and touching thing. The ring will one day mount the throne at Kate's finger. And while the new Queen consort will sit beside the new king, her beloved husband, the promise once made to Princess Diana will be fuffilled. On this day, the Princess of hearts will become the Queen of the hearts, a place that would would have been hers at the side of the future king Charles had their marriage be a true love one. Prince William has nothing of Edward VIII who was known as a nazi duke and was a shame for the UK. His wife who came to Germany and was offered a bunch of flowers by Hitler himself, soon became the mistress of one of Hitler's first arms afterthe first days after her marriage. They were not the romantic couple the media created while they bash on William and Kate. 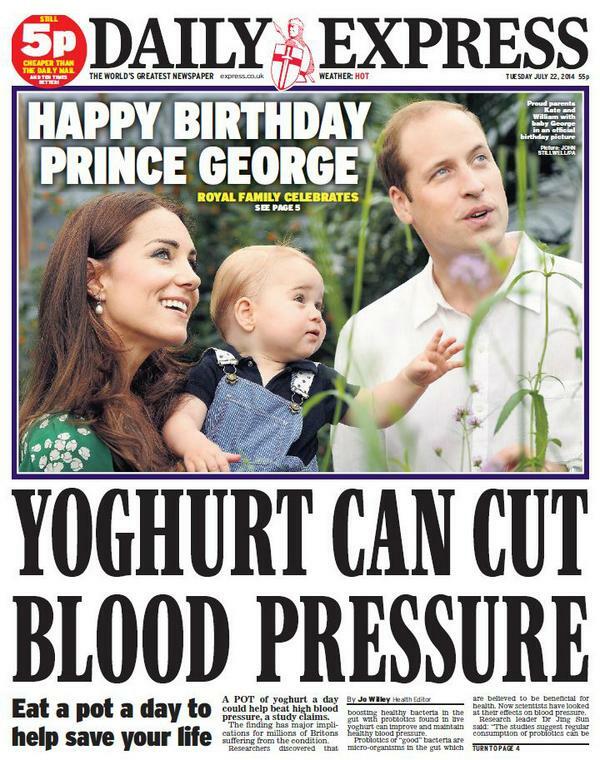 So, let the Sun predict whatever they want and let us celebrate in peace and joy the birthday of little Prince George! Have a wonderful day sweetie! We love you! I have always thought that William very well might posthumously restore his mother's HRH title when he becomes king. I doubt that he has forgotten his promise to give it back to her. Once king, with his father deceased it will hurt no one. I suspect it is also within his power to do it when the time comes. I don't think Diana's ring on Catherine's finger once she is Queen Consort will cut it. Prince G is quite a blend: I think he looks like his father AND Mr. Middleton!! Sad we won't see much of him for a while. Okay, sighers be warned, this is a cynical post. They remind me forceably of adverts for loo paper or nappies! The ones where a lovely young family, out on a weekend, are looking at something like a butterfly. (In fact since adverts like things like butterflies, I believe I've seen photos like this in adverts in the past.) The sort you find all the time in women's magazines. Instead of posing for a portrait, the family are doing something fun. It's what in art - Kate and William no doubt know this term -a genre photo rather than a portrait as such. The style is also used by photographers on the high street. It isn't bad, my mum used to love photos like that and clipped them. It's a very pretty set of photos. But the first one still looks like an advert photo which I don't think is the intent. Onto the subject of abdication. Who knows but it wouldn't surprise. Morton is making an educated guess and it will be a long time before anyone can call him on it. William seems to be one of those young men, we all know them, who are charming and nice but find it hard to settle in one professon. First, he's studying agriculture, then it's conservation, now he's back to helicopters. Being a king requires a large capacity for boredom and duty. a differet kind of bordom than waiting to be called out. I'm just not sure if William will want to settle down to that. He isn't a helicopter pilot. He is a future king playing at being a helicopter pilot. A real helicopter pilot not just needs to live on the salery and doesn't have huge country homes and flats in Kensington Palace should he feel like being in London - a real pilot takes holidays only when told he or she can; he or she takes heat from the boss, he or she are told what they can do, or not do; he and she are ordered about; he or she make be criticized openly by other employees. None of this will happen for William. He won't be treated ever quite as one of the boys, even if he thinks he is. (Because he doesn't really know the difference.) He will always be the Duke of Cambridge. Is he really going to pass at that Christmas shoot because he has Christmas duty. I don't think so. I suspect that he will be accommodated in many ways because it's flattering having a future king on board. We seem awfully close to Marie Antoinette being a milkmaid. William doesn't need that forty thousand pound salery or whatever it is and there are many more important ways he could give back that other helicopter pilots can't do. Just like Charles started the Princes Trust when he was younger than William. William is acting to please William. I'm sure he's a wonderful father and husband but it's very unclear what sort of king he will be. Edward VIII was just as dashing and popular as Willam but he couldn't bring himself to put public life over his private one. Plenty of his supporters at the time would happily have accepted a Queen Wallis but I think we were better off with our present queen and her father. Don't know what the answer is here. I remember one of the few things that Hasmet Khan really did say about Diana is that she wanted to be normal but only on her own terms, she really didn't know what normal was and that's why the relationship didn't work. I see a lot of that in William. Queen Wallis would've been a blackmail goldmine. Wasn't one of her lovers a high ranking German? Interesting comments, anon from Leominster! I suppose that William will never really know what 'normal' is, though. Apparently, he likes being with the Middletons, to experience a 'normal' family life, but they are obviously conscious who he is. What effect has his destiny (and position), his privileged life, his parents' unhappy marriage, his mother's death had on him and the choices he makes? We will never know for sure how it has shaped him, but it must have made an impact. Charles has managed to carve his own role, from an early age. As you say, he launched his 'Prince's Trust' when he was younger than William. I think that to some extent William is in a difficult position, an impossible position. He's not the 'Prince of Wales', his father is next in line to the throne. Perhaps it would be easier for him if he had a specific role to fulfil (i.e. kingly duties, when that time comes) We are lucky that we all have anonymity: it only becomes relevant, perhaps, when it has gone...some of us even prefer to post our comments anonymously!! Anonymous 00.15: Anon from Leominster is analysing; he/she is well-informed on this subject as well. anon from Leo, I think I see what you're saying about the last two photos (the subjects are engaged, rather than engaging us? If that makes sense. :) But it is nice to see them as a family with a happy, confident and curious little boy. anon 23:29, perhaps Wallis is looking down and wishing she was born a few decades later when it became acceptable for a mistress to marry a future King, even after being the third wheel in his marriage. Anon, London, I agree with your assessment of William's position. A tricky one for sure. There has been rumour of an affair between Wallis and Joachim von Ribbentrop, german Ambassador to the UK 1936-1938. Hello Anonymous. Where do I start. Well, first of all, Leo stated straight off that her post would be cynical yet you read it. Helpful hint: There's a scroll bar that takes you right past objectionable posts should you choose to use it. Secondly, how about telling us *why* she is wrong in her assessment? I would love to read an intelligent discussion. Anna- did you watch BBC "Upstairs, Downstairs," the second version-30 years later? There was a bit about a party that von Ribbentrop attended and apparently WWS was expected to also attend. There was some sort of merkey business going on. The host of the party worked in the Home Office and it looked very bad to have von Ribbentrop there. There was some sort of flirtation going on with von R. and the host's sister-in-law. Of course, that is television, but there is likely a morsel oft truth in there. Who knows what would have happened if George VI had not been there to lead Britain through the war, along with Churchill. More importantly, Edward VIII was forming some ominous alliances- appeasement was on the table. Personally, the Queen should celebrate, not mourn the abdication. UK owes WWS their gratitude. Anon 0:15, I used to have lots of nice things to say. I was delighted with William and Kate on their first two tours and also on the recent one. I was one of the strongest to jump in when Hillary Mantel spoke out about Kate, making claims that have now sound prophetic. I have always supported the couple on their increasingly rare appearances in England, and almost always like Kate's clothes. I had no problem with them taking a couple of years in Wales. It seemed right. But the time seemed to be coming for them to take on more, gradually, especially when Kensington Palace was prepared on a priority basisfor them. (Buckingham Palace needs a great deal of work and there is only so much public money.) But now it seems what it sometimes called a "bait and switch" - hope I'm using this term correctly. The couple have changed their minds, it seems - it seems not a completely done deal but is becoming more certain - they plan to live a most private life at their country house while keep Kensington Palace as more a pied a terre for their convenience than a residence for a working couple. I really don't feel I expect too much, an engagement or two a week, leaving ample time for George. If William would continue the work on the level he did this summer, and Kate matched it. (Assuming she isn't pregnant.) I would be happy, and I suspect many others would be happy too. But retreating into a private life while taking full royal benefits, that's another story. I support a working monarchy strongly but hope all members will be fully committed to it. It's not the few pence, it's the principle. But I absolutely, always support Charlotte and when there was briefly trouble with the blog, I was prepared to jump in and help keep it going. I also support all the posters on this blog, whether I agree with them or not, as long as there are no attacks on posting individuals. From years of work, I suppose I do see things in analytical way and do question things. But I know many others are asking questions too, about the purpose of the monarchy and that does concern me. Anon 00:15--Our AnonLeo writes with clarity, intelligence, lack of ego & pomposity--and NO nasty personal criticisms. Anon from Leominster, I do so appreciate every single time you post. Not counting the excellent history content, you also provoke inward thinking and good outward discussion which is as it should be. Your true view point as a citizen of England needs to be considered. It puts back in the equation the duties/roles of the monarchy and what is expected and should be expected especially when there are those who are reaping royal benefits. HAPPY BIRTHDAY, GEORGE! Greetings from Canada. Thank you everyone for mentioning to use "notify me", from the last post... will take a look at that. Happy birthday! All the best to you - may you live a long and healthy life! Suggestion for the next Kate loves: tennis. He is a darling boy. I often wish I could retrieve those special days with my children. The photos were a surprise as I expected something a little more formal; but it's lovely to see the family interacting with each other on a relaxed casual level. It's photos such as these that allow a subtle glimpse into the real life of William and Kate. Andrew Morton may have some bad history with the royal family, but he does express a valid point. I have noted before, that the UK and its Commonwealth will have an ageing monarchy for some time to come. There is not much wrong with having a "mature" ruler; but to keep the monarchy viable, younger royals need to show an active interest to champion the fellowship of the younger public. It may be that an abdication to allow a younger king/queen may be one of many answers to this matter. As to whether it is William that makes this move, or his offspring, is anyone's guess. I agree with your points about abdication. Prince Philip said in an interview a few years ago that he thought he'd done his bit and it was down to the younger generation now. But, sadly, it seems that he hasn't been able to scale back on his public duties very much. I think Philip's response to the abdication question was that it might be appropriate "when the younger generation could do better." Something like that...I'm almost positive. Reported that Catherine drove George to Buckingham Palace this morning to see HM. Where was it reported, Jean? Kate took George to see Prince Philip because he couldn't attend the party--previous engagement. Thank you, Jo. Blonde stands corrected here. LOL. They are a beautiful family but i think none of their official photos are good, for me the light is always wrong or taken in bad angles with distracting backgrounds. Anyway George is so adorable. P.D. Are we going to have a picture of George with a cake, a la Estelle of Sweden or not? Prince George gets more adorable each time we see him! I really like that their family photos have been so informal and relaxed, very much how I imagine they are in daily life. He seems to be a very happy, well-adjusted baby, a testament to his parents. I hope they continue to allow us the brief glimpses into their lives outside of being Royals and just as a normal family. Oh how I love these photos! It's just so nice to see a candid shot, because you really get a sense for how the family interacts. I think they're just lovely. As a parent now my expectations are set VERY low when it comes to photos of children (we have several experiences where HUNDREDS of photos were taken of us and our children and maybe a handful of those photos were usable!). I think that the photos are absolutely fantastic! George is such an adorable boy and it's clear that W&K love him dearly. I absolutely adore the Suzannah dress- the color suits Kate perfectly. I wish that I could purchase one for myself! The McQueen was definitely not my favorite, and although I like the coral/red color better it's still not something I swoon over. The high/low look is not something I find appealing at all. I think that Kate looked lovely that day with her hair back and with her accessories, but the dress in that color was quite matronly! Dear Charlotte, I so love and look forward to all your posts, but this one is absolutely over the top fabulous. I am not a family oriented person, but something in the photos and post make me feel so serenely happy, as if I am part of this family. It is a marvelous thing, in the true sense of marvelous. This family, and your posts and blog of course, make me feel so very confident in the future of the Monarchy. I am tearing up, which I never do. Thank you from the bottom of my heart. I so hope this lovely family enjoys however many years to come in the privacy (as Bluhare distinguish from reclusion) of Amner Hall. Many happy returns of the day to HRH Prince George of Cambridgod Save the Queen. Well-written, Jennifer. I don't know if I could be as diplomatic I catch your drift (Esti-understand your meanng) Still, I don't think it is just a matter of whether a monarch can perform the duties effectively or not. There are other considerations. Nice pictures. Although I too believe there are too many distracting elements in the first one. My favorite family portrait remains the picture taken at their KP window. I have always believed William is one to shock the world and abdicate. I see him in pictures and know how he dislikes having to share his life and "being on display", he isn't fulfilled with royal duties and most of the times he comes across as annoyed and mad to me. Then I read how much he loves the Middletons and their life and how he wants to be "normal" and so forth... it simply wouldn't shock me if he were to abdicate. I wonder if he could abdicate for his son as well. Harry certainly seems like someone who would enjoy "even being king"
I can't imagine William throwing aside his birthright. He's young yet--but has a sense of destiny-& being in charge!! I think you said that very well. These ARE completely different times from when the Queen came to the throne. And William's coronation could be 25 or 30 years off (I probably won't live to see it, sobering thought.) He is doing what his sovereign is asking him to right now and that is all that matters. And I think it is telling that the Queen chose Kate to go to Malta. It is somewhere that is dear to her heart and yet won't be overwhelming. It is like the Queen wants to share a little piece of her private history with a loved granddaughter-in-law. Valerie- a really sobering thought to me - if QEII lives to 102, as her mother did, that means Charles will be past 80 when he takes the throne. Does the UK or just GB as it may be then- really want to go through a coronation for an octogenerian? It's like choosing an 80-year-old Pope. You know you're going to have to do it all over again soon. William, on the other hand, will be a robust 48. Speaking of father's abdicating in favor of sons. marg, I hope she does live as long as the QM. Thanks always for another great post Charlotte! Love this family! All 3 pictures are just precious! 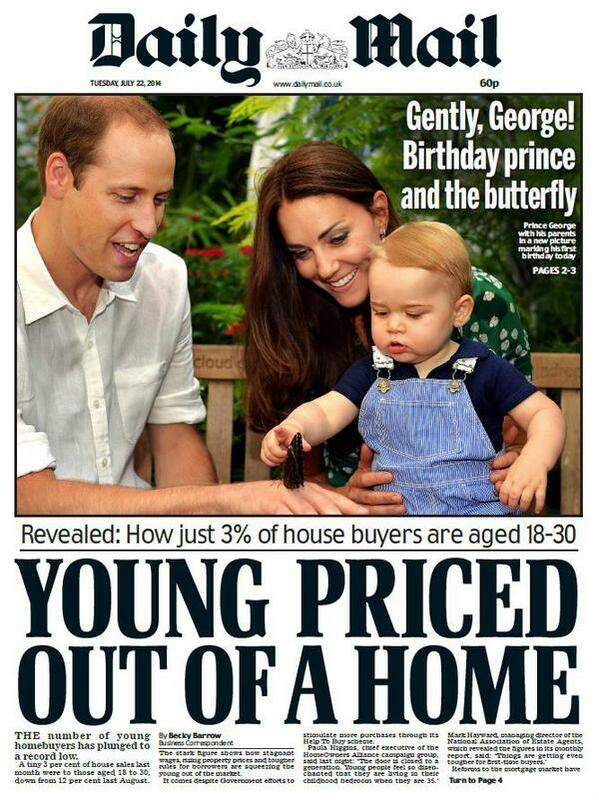 I really respect William and Kate in how they are raising Prince George and the choices they make for him. I am sure it is the biggest challenge they will ever have to be true to themselves and how they want to raise their family their very own way with the positions they hold. It is just lovely how they decided to have these pictures taken and released for his birthday and also make a statement of thanks to the public. My birthday in July 23rd, so I am thrilled that now every year before my day there will be stories of Prince George and pictures of him in the news. Such wonderful happiness to see in this world that is filled with so many sad and tragic stories everyday. This family is such a breath of fresh air in this world!! God bless them!! Happy Birthday , Jen! That IS nice to celebrate your day with new photos of George! Bucolic and romantic pictures of a happy little family! Esti, do you think that Felipe and Letizia look more relaxed lately? Maybe it is easier for them to be more natural now that they are King and Queen...? ROYALFAN: Yes, of course, especially Letizia, right now she has a job. When she was a Princess she has to walk two steps behind her husband, she could´t answer to him in public...But nowadays she´s the Queen, Sofia lives in London.........Besides Letizia used to work before she´s got married, she´s a journalist even Felipe´s diction has got better, thanks her. I think they look happier now (just more relaxed). But I didn't know that Sofia lives in London. Interesting! Hear hear, Esti. As an accomplished journalist and TV presenter Letizia would have been a few steps ahead and I am sure there was a lot Felipe could learn from her. I always thought it was so cruel that she was reduced to portraying the smiling, silent and modest wife of the heir. I don't understand why the royal family would demand such old-fashion behaviour. Especially in Spain. I have high respect for spanish people because they digged their way out of decades of dictatorship. And after the return of democracy, the change in the status of women was dramatic. That's why it seems so strange that Letizia had to fit into this dated role image. I hope she has the power now to be the woman and queen she wants to be. Anna, perhaps the role she played had more to do with pleasing the royal ladies in the family than the men. Interesting point royalfan. I guess it's hard to say which forces were actually behind something many of us perceive as restriction. Maybe Esti has better insides? Regarding Queen Sophia, aren't she and King Juan Carlos kind of unofficially separated? Royalfan--speaking of... Beatrice and Eugenie may regret freezing out Kate--some day. Juan Carlos and Sofía are separated 35 years ago (it´s a well known secret), but a monarchic marriage is a professional commitment and Sofía always has been a profesional woman and a Queen, the most important is the Crown, not the individual person....(We all know at least in Spain that the Duke of Edinburgh has cheated the Queen all his life, but that´s not a public thing,and nobody should speak about their private life...). Jo, I don't know if they have gone that far, but I do think that Kate's cover girl appeal doesn't sit well with two ladies who are criticized more often than not for their fashion choices. I don't know about you, but I have yet to read an article about something selling out because Beatrice or Eugenie wore it. If I am wrong, please let me know. LOVE that pink dress on Kate. She looks very elegant and the pale pink is very flattering. I may be the only one, but I don't care for the dress in poppy. Too strong a color for me - too orangy. eelady - I am with you on the pink version of the dress. In my opinion, the soft pink really does compliment the style of the dress. "Lovely" colour and sharp cut makes for a good balance. It was one of my tour favourites. Even more so with the way Kate had styled her hair. You're not the only one. I agree 100%. Royalfan--Please help!! HOW do you comment from blogger? It keeps asking me to CREATE a blog! I don't WANT to! Jo, you will have to set up a profile, but you can choose your privacy settings if that is your concern. I liked the dress in pink. Better than the pink she wore a few times last year. Also, I see Kate wore the green dress under a coat. Does it not get very hot in England during summer? I can't even imagine wearing a full coat over a dress during the summer. But I find it both silly and insulting when an individual posts under different profiles and thinks the rest of us are too ignorant to realize it. It's easy to change a profile....yet the message and tone remain the same. Royalfan, thank you for bringing it up. It's a point I have addressed with a poster this week. Thanks, Jo. But it seems the games continue. Sigh. Did you steal my secret decoder ring, royalfan? It seems to be missing! The subject will taboo in Charles's lifetime too-- he adored his grandmother who has said "I'm not as nice as people think." I have learnt that when people say things like that, believe them.